This week we saw the public launch of the NZ Chinese Digital Communities web site, a lovely piece of collaboration between the New Zealand Chinese Association, Auckland, and the Auckland City Library, as well as a bunch of other key players including Katipo, ongoing makers to the Kete software. Also in the van are the DIA, NZ Department of Internal Affairs, who shepherded the project through the last of the Community Partnership Fund, and, dare I say my own company McGovern Online who worked on the original strategy and Business Requirements, and first iteration of the design. The site consists of a swag of social networking/web 2.0 type tools which give people the chance to tell their story about 'being Chinese in New Zealand'. This might include family history - cooking recipies, festivals, or other local and personal history. At the core of the offer is a recognition of family as a key value and institution to Chinese society, and that family history is often private - and always personal. Private group areas reflect this purpose. As is the ability to form virtual groups and share resources and ideas. Also ready to hand are the usual Kete tools like image - video- audio sets - as well as new and extending search, tagging , and mapping tools which allow stories to be searched, bunched and contextualized, both conceptually, and geographically. And of course, as a result of a former collaboration with the APN, Kete also has Creative Commons options built in at a story and/or item level. It is also OAI enhanced, which makes it available for harvest in the likes of Digital New Zealand. I've discussed the development of Kete, and the community of practice that underpins it elsewhere - suffice to say it remains a key software resource to the growing community of practice around capturing and building rich seams of community memory in New Zealand. Contextual search to Auckland City Library and other knowledge/heritage assets. 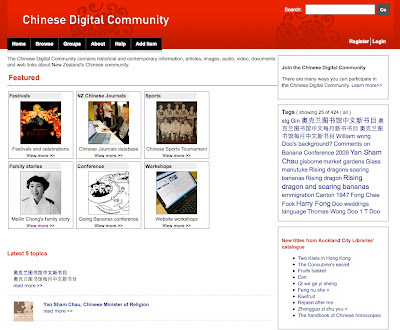 The Chinese Digital Communities site has added another layer to the community of practice. 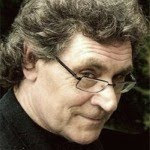 Thus a key driver to the strategy behind the site is to connect people's stories to the richer wider world of local, national, and cultural sources which match the interest, context, or ideas inside the stories. And of course, of especial interest is how to connect to the assets of Auckland Public Libraries. In short, from the outset the project wanted to create rich new stores of family and community memory, and then build pathways which would connect these to repositories of public knowledge and heritage sources that linked to, or expanded the reach of the community or family memory. To achieve this, Auckland City Library staff worked hard to identify their own in-house sources books, tapes, video etc, as well as build up a rich understanding of where other secondary sources are. They also partnered with the Alexander Turnbul Library to create new sources by digitising New Zealand Chinese Journals from the late 19th and early 20th century. These include The Man Sing Times, published between 1921 and 1922, the New Zealand Chinese Weekly News, between 1937 and 1946, and the New Zealand Chinese Growers between 1949 and 1972. Collectively these periodicals cover some 50 years of Chinese New Zealand history. The project partnership with the New Zealand Chinese Association and Auckland City Library is neither accidental, or temporary. It has developed over the last five years, and has grown hand in hand with a growing understanding of the depth and reach of Chinese culture in New Zealand, especially inside the NZ Chinese Community itself, and how it links to the New Zealand heritage as a whole. This has included a growing understanding of the historical texture of various aspects of Chinese New Zealand life and heritage - which in turn has created platforms to explore what it it means to be a Chinese New Zealander, or a Chinese in New Zealand. From this dialogue has emerged a three fold way of thinking about Chinese communities. The first fold involves a growing understanding of the history of what is known as the Poll Tax generation, whose descendants form the first phase of New Zealand Chinese communities in New Zealand. Drawn in part by the lure of the Otago goldfields in the late 19th century, this original generation were subject to draconian poll tax imposts, as well as other restrictions on their rights and movements. Te Ara, the NZ Online Encyclopedia has an excellent article on this, here. This history and the pain that this caused was acknowledged by the NZ government by way of a public apology in 2002 and the setting up of Poll Tax Heritage Trust in 2005. The Trust's income provides funding for heritage and cultural projects which serve the history and current needs of this generation. The other folds involve the emergence of two other communities of Chinese New Zealanders. The first group is clustered around the families of the immigration wave that occurred in the mid 80's, primarily from Taiwan and the south East Asian sector. By definition many of the children of this group were educated as young New Zealanders, and are now part of the multicultural mix of Gen Y in the likes of Auckland, Wellington and elsewhere. The third, and most recent wave consists of many new arrivals from mainland China, especially the burgeoning cities of Beijing and Shanghai. Many of the latter include students, and other young people. All three groups make substantial contributions to many of the new cultural intersections that give visibility to the New Zealand Chinese culture, including the likes of the Auckland Lantern Festival. Also of note is the annual conference Rising Dragons, Soaring Bananas , a forum where NZ Chinese come together to celebrate and discuss issues of identity, creativity, and economic partnerships. Accordingly, it was no accident that the Digital Chinese Communities web site was launched last Saturday at the latest iteration, Make Way for Rising Dragons, Soaring Bananas, conference at Auckland Business School. Presented by the New Zealand Chinese Association Auckland Inc. and the International Society for the Studies of Chinese Overseas (ISSCO), Rising Dragons, Soaring Bananas International brought together the creative arts, media, academic, community and business sectors. Affectionately known as the 'Banana Conference', this year's event was the fourth effort in the Going Bananas cycle. Cultural storytelling forms the backbone of the conference. These stories disrupt stereotypes and build a community of interest in Chinese lives and experiences. This years speakers included, Libby Wong (Writer and former Hong Kong Legislative Councillor); Marcus Lui (Creative Director, The One Centre, Sydney); Mai Chen (Chen Palmer, Public Law Specialists); Don Ha (Real Estate Entrepreneur); Paul Spoonley (Massey University); Ron Sang (Architect and Art Collector); Chang Hung (Radio Producer and TV Presenter); Peap Tarr (Urban Artist); Natalie Chan (Fashion Designer and Milliner); Jock Phillips (Editor, Te Ara, The Encyclopedia of New Zealand); Peter Li (University of Saskatchewan); Tan Chee-Beng (Chinese University of Hong Kong). More at their web site, here.